In a landmark judgement, the Bombay High Court has directed the government of Maharashtra to demolish all the illegal shrines in the state by year-end. The Division Bench of Justice Abhay Oka and Justice Ahmed Sayed has given a deadline of 31 December this year to identify and demolish all illegal religious structures in the state. The high court observed that no religion encourages illegal structures on public property for worship. All the illegal religious structures built after September 2009 will have to be demolished as per the high court order. Mumbai-based Non Governmental Organisation (NGO) Society for Fast Justice had filed a Public Interest Litigation (PIL) at Bombay High Court in 2010, seeking action against illegal shrines built across the state. Majority of these shrines are built either along the roads or on footpaths. It is in the violation of every citizen's right to walk on obstacle-free pavements. According to Municipal Corporation of Greater Mumbai (MCGM) sources, there are 482 illegal religious structures across Mumbai. The majority of them are in Byculla, Dadar and Andheri (West). Interestingly, during the pendency of the PIL since 2010, the government of Maharashtra even issued a Government Resolution (GR) stating that all the unauthorised shrines built along roads and on pavements, which prove to be a hurdle in walking, shall be razed. The GR also specified that the unauthorised shrines built after 2010 shall not be regularised. During the hearing, the Bombay HC observed that the government has failed to follow its own deadline. The court also instructed the government machinery that it should not be pressurised by any political leader while demolishing the illegal shrines. In case, there is political pressure, criminal proceedings should be initiated against the political leader, the HC said in the order. 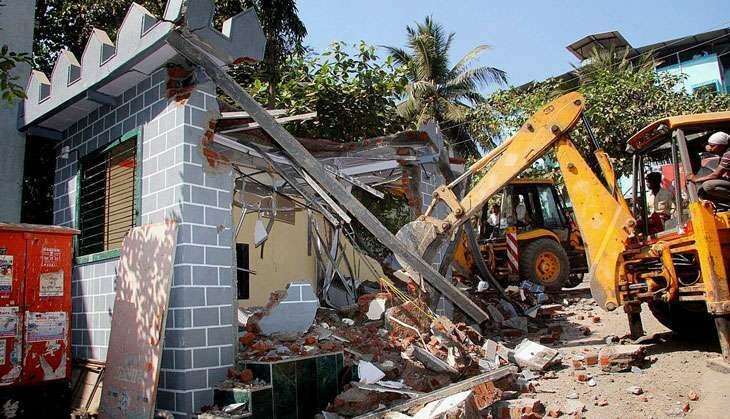 The responsibility to ensure demolition has been bestowed on Municipal Commissioners in Municipal Corporation areas and the district collectors in rural areas of the state. The HC has also ordered police commissioners and superintendents of police to provide adequate protection to the demolition squad to prevent any law and order situation as well as any untoward incident. While issuing the directions, the Bombay HC did not let the government off the hook. The order said that the judgement is not the end of the court's role. The court will continue to monitor the progress in the matter and the work done by civic authorities. The HC also directed civic authorities to submit a compliance report on 30 November. According to the court order, the state government was also asked to include a 'action taken report' in the matter of manhandling of a tehsildar by Shiv Sena leader in Aurangabad district, who was on a demolition drive for unauthorised religious structures. The compliance reports are to be filed at the Bombay HC every month. Division Bench expressed displeasure over the fact that the state government has failed to implement the GR issued to demolish illegal shrines. "There has been no action in this regard but paperwork. The government has not done anything to ensure the implementation of its own GR," the HC said. As per the GR issued in November 2015, all unauthorised shrines in Maharashtra were to be demolished within six months. After an interim order by Supreme Court, a GR on 5 May 2011 and in 2015, the state government had prescribed a detailed scheme to take action against illegal religious structures such as regularisation, relocation and removal. The GR also proposed the formation of special committees - district level and municipal corporation level - in Mumbai, Thane and Pune. According to the information furnished by the state government in the Bombay High Court, there are 871 illegal religious structures built in municipal corporation limits after September 2009, out of these only 225 have been demolished. While in other parts of the state there are 874 illegal unauthorised structures and 159 have been demolished till now.